What will waiting to buy cost you? The Williamsburg real estate market and surrounding areas has really heated up. Inventory is low and homes are selling at a much faster pace than we have seen in years. This is great for sellers, but how does it affect buyers? Rates are also on the rise and low inventory is driving up values and prices. 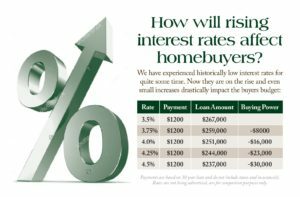 The chart below outlines how slight increases in interest rates can drastically affect your buying power. In short, if you are considering a purchase, now is definitely the time. As the overall economy improves, rates will likely continue to rise throughout the year. Rent prices in the Williamsburg area has also continued to rise and in many cases, the cost of buying a home can be less that the cost of renting. I am happy to discuss the process with any potential first time buyer and explain the steps to becoming a homeowner. It is not as difficult as you may think. Williamsburg real estate is my specialty and can help you find the perfect fit and area for your needs. For folks that already own a home, now is also a great time to upgrade or downsize if that is something you have been considering. Since the market is strong, it is not only a great time to buy, but also a great time to sell. Contact me today to discuss your real estate goals. As a native to the Williamsburg area having been in the business for nearly 20 years, I am certain I can help you reach them. Buyer Information Form What's My Home Worth?